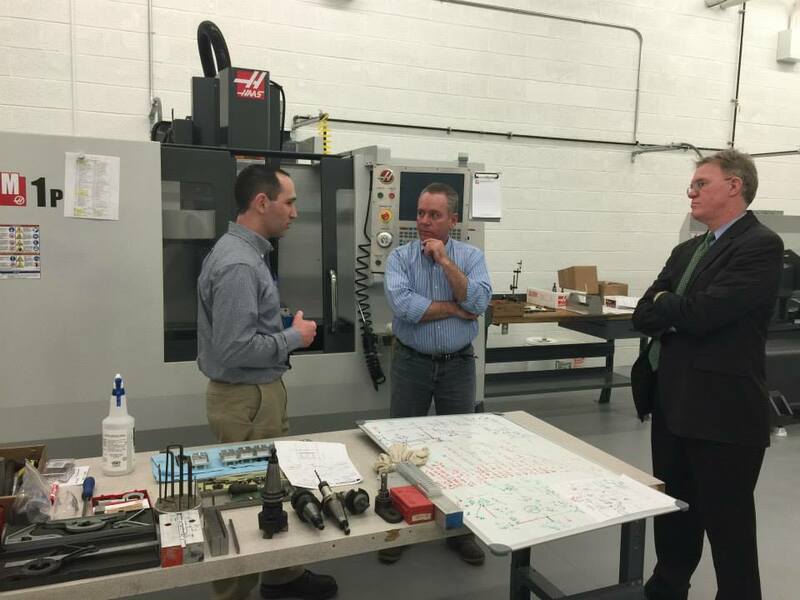 Rep. Roy speaking with instructor Bob Vozzella and Superintendent Steve Dockrey at Tri-County’s new advanced manufacturing site. State and federal officials will join representatives from local manufacturing companies at Tri-County Regional Vocational Technical High School on Friday, March 27, for a roundtable discussion about the state of the advanced manufacturing industry and its ever-growing need for skilled workers. The roundtable, hosted by Tri-County administrators, Representative John Fernandes (D-Milford), and Representative Jeffrey Roy (D-Franklin), will begin at 8:45 a.m. in the school’s library. U.S. Representative Joseph P. Kennedy III and Massachusetts Secretary of Housing and Economic Development Jay Ash are among the officials who will be in attendance. They will be joined by representatives from the 495/MetroWest Partnership, MassDevelopment, and National Grid. Manufacturers from all of Tri-County’s 11 sending towns will also be in attendance. This will be the third roundtable held at Tri-County in just over a year. Previous meetings focused on addressing the skilled labor shortage in Massachusetts. This year’s event will focus on progress made since those roundtables and the work that still needs to be done. Tri-County used recommendations from the previous roundtables to purchase manufacturing equipment in fall 2014. The CNC Toolroom Vertical Machining Center and the CNC Toolroom Turning Center were purchased through the FY14 Vocational Opportunity Challenge (VOC) Grant. Shortly after purchasing the equipment, Tri-County partnered with the Wentworth Institute of Technology. In January, the college launched its first class in Tri-County’s newly renovated advanced manufacturing facility. Instructor Bob Vozzella said some of his students drive more than an hour to take the 15-week Machine Tool Setup and Operation course. The new equipment will also be used by the high school’s Engineering Technology Program. The program uses a hands-on exploratory approach with state-of-the-art technologies and tools to introduce students to various engineering concepts. This machinery will allow the instructors to implement advanced manufacturing concepts as part of their curriculum. “The equipment will not be idle during the day, since the Engineering students will be trained to use code to design and create parts for projects. Our robotics team at times will need to create unique parts, and having this equipment will be invaluable. These two machines are of the highest industry standard, and will offer one more career pathway for students in the Engineering program,” said Jean George, Tri-County’s Vocational Coordinator. While the two machines are a good start, the school hopes to add more equipment and expand its operations.